Edit: Sean Owen, one of the developers for ZXing has posted a comment to this blog warning of the pitfalls of integrating ZXing into your own app; doing so just to avoid having your users take that extra step of installing from the market is not a good reason. I completely agree with this. There are many advantages to using the intent based approach as outlined in his comments. My motivation is for an enterprise app that does not have access to the Android market and involves my client installing zxing manually on thousands of devices before they are able to distribute to its business customers. So to be clear, do not use this method unless it is absolutely necessary, and if you do have to – make sure that override your intent filters so that other apps that want to use zxing do not end up calling your modified version. Also, if zxing is already installed, then you should use that by default instead of your modified version. ZXing is one of the most popular barcode scanning applications on the market. They make it very easy for you to integrate into your application via an intent but this means that your users must manually install the application from the market. Fortunately, the app is also open source so I will show you how to cleanly build this capability into your project. The src can be found at http://code.google.com/p/zxing/source/browse/trunk. Specifically you only need the android/ and the core/ projects. Use svn to checkout these to your local hard-drive. You will need to build the core project into a jar file using apache ant (download from herehttp://ant.apache.org/ivy/download.cgi). Using a shell or cmd prompt navigate to the root directory of the downloaded zxing src and execute ”ant -f core/build.xml”. This will produce a file core/core.jar which we will use in the next step. Create a New Android Project (File –> New –> Android Project). Set the project name to ZXing (or similar). The project will not currently build. We need to add the core.jar file (that we produced in the previous step) into our project. Right-click on ZXing project –> properties –> Java Build Path –> Add External Jars –> Navigate to and select core.jar –> Open –> OK.
Actually, while we’re here we should do one more very important thing! Right-click on ZXing project –> properties –> Android –> Scroll down and check/tick the “Is Library” checkbox –> OK. Step 4: Include ZXing Android into your project. Within Eclipse, Right-click on YOURPROJECTNAMEHERE project –> properties –>Android –> Scroll down to Libraries section –> Click Add –> Select ZXing (which should appear as an option as a result of completing previous step). Almost there! One of the current limitations of Android Library projects is that it will not pull anything from AndroidManifest.xml into your project. So if we try to invoke the above code we will receive a runtime exception because your Android app has no idea how to handle the scan intent. EDIT: You need to do yet one more thing! You need to add the core.jar (produced in Step two) to your new project (Right-click your project –> Properties –> Java Build Path –> Add External JARS… –> Select core.jar –> OK). Thanks to Marco and Markosys in the comments for spotting and pointing out the omission! During one of my projects , I needed server side printing of BIRT report in which User Interaction was not required ie Background Printing. By the term “No User Interaction” , Print Dialog is not involved anywhere. It could be used for batch printing. Or A copy of viewed report is printed on the server without letting the user to know it. BIRT provides server side printing but again it comes to User Interaction.Here BIRT’s ReportEngine API Plays a important role. (1). Create a servlet which can be invoked from a simple Java Program or any stored procedure. (3). Print this generated pdf through Java and delete it. * Use the printer which comes as parameter from URL. * So that we can redirect the print at runtime to any of the printer. printer : Parameter specifies the printer location. PDFRenderer needs to be in your classpath for printing PDF files. Loading Report Engine is costly task so it is recommended to have it one time only. Source code for this blog post is available as a complete Eclipse project athttp://github.com/mikeplate/ListViewDemo (zip download link in upper right corner). I have an editText, starting value is $0.00. When you press 1, it changes to $0.01. Press 4, it goes to $0.14. Press 8, $1.48. Press backspace, $0.14, etc. That works, the problem is, if somebody manually positions the cursor, problems occur in the formatting. If they were to delete the decimal, it won’t come back. If they put the cursor in front of the decimal and type 2, it will display $02.00 instead of $2.00. If they try to delete the $ it will delete a digit instead, for example. One of the most common questions for people that are new to BIRT is about how to ask data from the DataSet in the report. The question is when building expressions should I use dataSetRow[“FIELD”] or row[“FIELD”]? So if we add a computed column to the DataSet called compCityState, the expression would look like this. Once a computed column is created, you can reference that computed column using the same row syntax. So in the OnFetch method you could add this message to log the value of the computed column. The other place that you can access variable on the DataSet is through ReportItem binding. In most cases, this means Table Binding where you have attached a table to a DataSet. In general, when you use BIRT you associate a Table with a DataSet. We say that the Table is bound to the DataSet. When a DataSet is dragged to the Layout editor, BIRT automatically does the data binding and creates a bound column for each field and computed column in the DataSet. The following shows a table and its Binding. 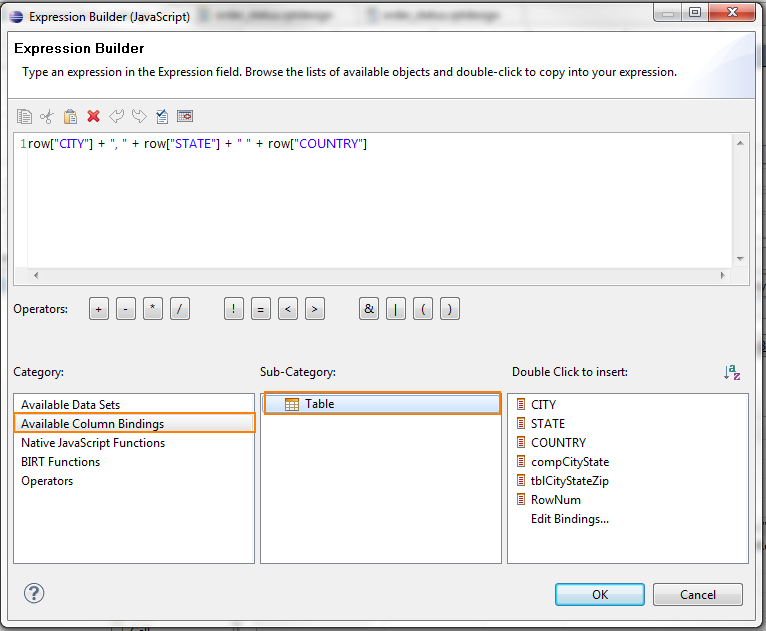 When you add a binding to a table you are brought to the expression builder. In this first example, I am creating a table binding that gathers data straight from the DataSet. Because I am referencing the DataSet directly the expression uses the dataSetRow syntax. In the next example, I will use the previously established bindings to build the expression. 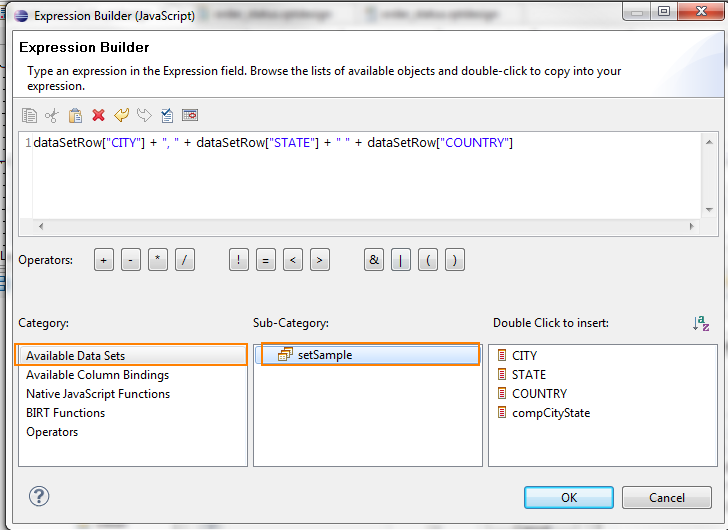 In the expression builder I will select Available Column Bindings and the Table and then select the fields. You will also notice that the Table Binding has access to any of the previously bound fields and a special RowNumber field. So the short answer is, dataSetRow syntax references the original values from the DataSet, whereas the row syntax references the bound column values. Now for a quick test, this should be easy. Imagine that I change the expression of the CITY expression to look like this, and all else remains the same. What will a DataItem that is showing rowCityStateZip display? What will a DataItem that is showing tablCityStateCountry display? The answers will be after a short shameless promotion of my companies BIRT training program. We have designed a modular training program that is focused on teaching you how BIRT works. You can take one module or all of them. The focus of our training is on how BIRT works, so that when you finish you really understand what is going on in the product. Our training can be taken on-site, or through remote sessions of between two and four hours each. We are also happy to work with your team to customize the training to match your companies needs. If you are interested, please visit our web site and have a look. 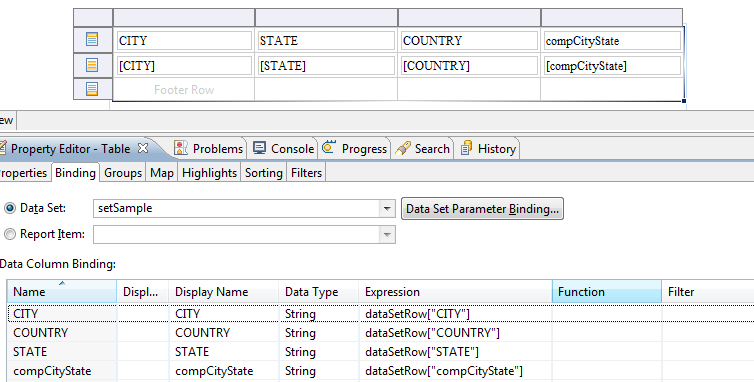 Remember, dataSetRow syntax (as used in tablCityStateCountry) goes back to the original data. Row syntax use the table binding. Note: If youre using Java 1.5, you will use sqljdbc.jar, if your using Java 1.6, you will use sqljdbc4.jar. If this is an existing report, Double Click on an existing Data Source, otherwise create a new Data Source. Call it whatever. From the Data Source editor, click on the Manage Drivers button. Navigate to where you have either the sqljdbc.jar or sqljdbc4.jar file, and click Open. This will add the driver to the BIRT Designer. Now, click on the Drivers Tab. Double click on the SqlServerDriver entry to edit it. Put in a name, and a URL template that will prompt you on the correct URL pattern to use. Click on OK, and OK, until you get to the Data Source Editor Dialog. Select the SQL Server driver from the drop down list. It will automatically put in the template. Replace the IP Address, and Database name with the ip of your Sql Server Database, and the name of the database. Enter the correct User Name and Password. That’s it, your done. Test Connection to make sure the information is correct, and hit OK.
Eclipse BirtThis tutorial describes how to use Eclipse BIRT for reporting on simple Java Objects (POJO’s). The tutorial explains also how to deploy the resulting BIRT report into a webcontainer (Tomcat) and how to use it in an Eclipse RCP application. Eclipse 3.7 (Indigo) is used for this tutorial. Eclipse BIRT allows the creation of reports based on data from different data sources. Data sources define where the data is stored. You use in BIRT “Data sets” to defines queries on data source. These data sets can be used in a report. In a Java program it is often convenient to use Java objects as a data source for reports. This article will focus on the usage of plain old Java objects (POJO) as data sources for BIRT reports. Use the Eclipse Update Manager to install “Business Intelligence, Reporting and Charting” -> BIRT Framework. Create a new Java Project with the name “de.vogella.birt.stocks”. Create a new report “stock_report.rptdesign” via File -> New -> Other -> Business Intelligence and Reporting -> Report. The new report is displayed in the “Report Design” perspective. Delete everything in the example report except the report header. The result should look like the following. The report will display stock data. To demonstrate BIRT we use a Mock object for providing the data. Create package “de.vogella.birt.stocks.model” and then the following class. This class will represent the domain model. Create the package “de.vogella.birt.stocks.daomock” and then the following class “StockDaoMock”. This will only mock / fake the data and not really get it from the Internet. As we want to learn BIRT here this should be fine. The data source connects your data with your report. BIRT provides different types of data sources, we use the “Scripted Data Source”. Go back to your stocks_report, use the “Report Design” perspective and select the “Data Explorer” View. You have to select your report to display the content of the datasource view. Create a new datasource, named “srcStocks” in your report. The dataset defines the mapping for the datasource data and the BIRT data. Create a new dataset named “dataSetSocks”. Press next and define the columns for your report. In case you don’t see the script please node that the editor for the report has several tab. One of it is labeled “source”. Place the following coding in the fetch script. Check if your Script works by doubleclicking on the dataset -> Preview Result. We will now display the data in a table. Switch from “Data Explorer” to the “Palette”. Select the tab “Layout”. Drag and drop the table element on the report. Define the following settings for the table. Change back to the “Data Explorer”. 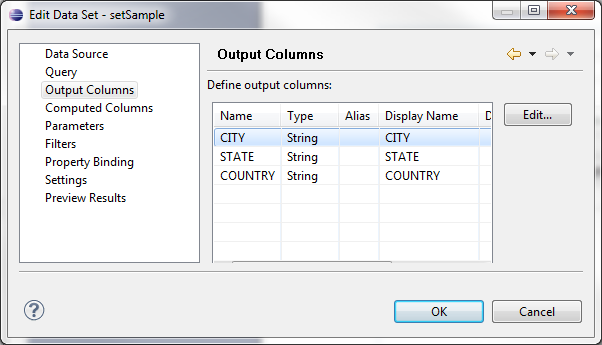 And drag and drop the dataset columns into the “Details row” of the table. The result should look like the following. Switch back to the Palette, select a chart and drag and drop it on your report. Choose the Line Chart with the standard settings. Press Next and select your data set. At the next step we have to assign the columns to the axis. We assign the date to the x axis and the open value to the y axis via drag and drop. Define 5 series in total. Assign the columns to these series by dragging the column to the Sum sign. Currently the x axis shows first the newest date. Reverse the x axis by you have to sort the data ascending. Press the highlighted button. Go to the next tab and give titles to your columns. Hide the last one. Change the display of the lines via the following. Press finish to include your chart into your report. We will use a standalone Tomcat 6.0 which we assume is already installed. See Apache Tomcat Tutorial for details. You need the “Deployment components of BIRT” http://download.eclipse.org/birt/downloads/. Copy the birt.war of this download into the Tomcat webappsfolder. Currently you have to install org.eclipse.commons.logging separately into Tomcat. Download this lib from http://commons.apache.org/logging/ and put the jars into the lib folder of Tomcat. The Birt example should be available under http://localhost:8080/birt/.If you see something like this, your Tomcat an your Web Viewer should work correct. To run your own reports you have to copy the .rptdesign file in the root of the birt folder in Tomcat. To make your Java classes available export your project into a jar file. After that the jar file has to be copied to the Tomcat webapps/birt/WEB-INF/lib/ directory. Restart the Tomcat and navigate to your report. If you want to export your report to PDF you also need the library iText from (http://prdownloads.sourceforge.net/itext/itext-1.3.jar ) . Copy the iText.jar in “/birt-viewer/WEB-INF/platform/plugins/com.lowagie.itext/lib”. Now restart the Tomcat. We can use the Birtviewer also in a local RCP Application, it isn’t more than an browser view which shows a HTML Page generated by an integrated Webserver. The following assumes that you are already familiar with Eclipse RCP development. See Eclipse RCP Tutorial in case you need an introduction. Convert “de.vogella.birt.stocks” to a plugin project, via right mouse click -> Configure -> “Convert to plug-in project”. Create an new plugin project “de.vogella.birt.stocks.rcp”. Select the template “RCP Application with a view”. Add the following plugins as dependendies to “de.vogella.birt.stocks.rcp”. Use this code as View.java. Before posting questions, please see the vogella FAQ. If you have questions or find an error in this article please use the www.vogella.de Google Group. I have created a short list how to create good questions which might also help you.